Everyone wants to be a superstar on the track. Unfortunately, not that many people want to legitimately work towards being a superstar. Of the remainder, a good chunk of people ARE super motivated, but they aren’t sure where to focus that energy to get results. 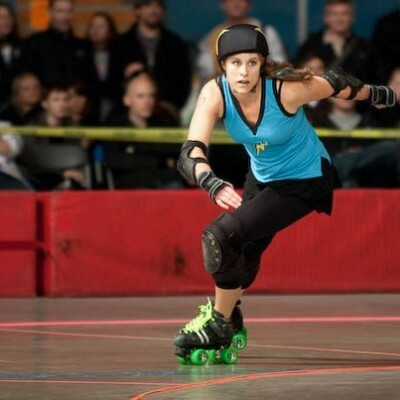 Here’s the thing – everything you want to be on the track (agile, a hard hitter, a powerful jammer) involves a complex of high-level skills and abilities. You have to work on the individual abilities before you can excel at the top level of compounded and combined skills. Strength is the building block of all the other skills we want to compound to become MVP superstars on the track. Without strength, you can’t have power, or agility. Without strength, your cardio endurance isn’t enough to propel you around the track for your minimum laps. So, it’s time for Basic Training. I’ve lifted this workout right out of the Pump Up Your Jam training program. It’s just one of the weekly “AM Strength” workouts that is a part of this 6-week training program. We call it AM Strength because it’s most effective if you get up and do it in the morning, first thing. Where was I? Oh right, first thing. Pop out of bed, warm up lightly (a few half squats, some push-ups against the wall…), and you’re on your way. There’s no jumping, so you won’t disturb your neighbours/kids/roommates/cats. It should take you 15 minutes. AND IT WORKS! Do this workout any time – it is not so intense that you can’t double it up with another workout (like an interval workout, or practice), or do it several days in a row. Psst: Pump Up Your Jam is starting Wednesday May 10th, 2017. You can still register, but spaces are filling up and it always sells out! Click here for all the PUYJ details to find out more and to get signed up! Watch the video and follow the form that I use! Don’t rush, keep good head/neck/hip/knee alignment, and modify or reduce the rep count if you need to. I really believe that if you give this a shot, and do this or a workout like it a few times a week, that you can see noticeable improvement in the way your body works for you on the track!! PS want more strength training? Check out the StrideBooster training program. 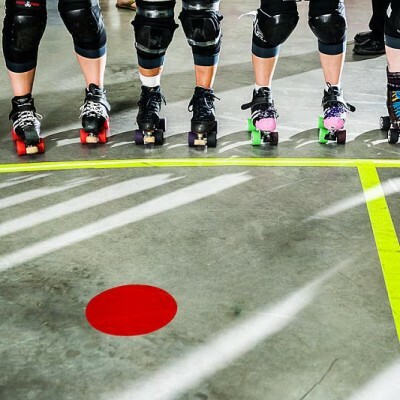 Hi , I’m a fresh meat roller Derby in London . Just about I can roll straight is any technique to help me to improve faster on barking and curving and swerving? Hi Arminda! To be able to turn quickly, you need to get comfortable transferring your weight to one side and using your edges. You can practice in shoes, then in skates while holding a rail or wall, then while rolling. It’s ALL about the weight transfer – if you don’t shift, you wont turn. You can also make sure you’re looking in the direction you want to go, and turning your shoulders and hips in that direction too. If you look, the rest will follow. Good luck! Sorry…. Just saying Hi to Arminda in London. I was researching Derby in Texas. I did a double take when I saw your / my name. I NEVER see anything posted wbere someone has the same name as me ? A friend and I started a team here in Necochea ( buenos aires) called “Sudestada Roller Derby Necochea (facebook page). We are fresh meat but, we try to do the best when we train. Here is the question, I don’t know, or a can’t figure out. what energy sistem must we train ?, I mean, aerobic, anaerobic. both. Couse, they are not the same, and i want to do my best when i make their workouts. i’ll be surprised if you aswer me, and so much greatfull.